Amenities: Travel information center including an electronic information kiosk, disabled and companion restrooms, pet exercise area, walking pathways, solar station viewing area, native plant gardens, forested landscape, onsite supervision for travelers, 24-hour call line. Why French Prairie is the largest rest area in the state: Constructed in 1966, and as part of government’s awareness of the Cold War era, French Prairie’s location and size made it a perfect venue for staging military operations. Only a short distance from Portland Metro, and with the potential to accommodate rapid military vehicle deployment, the rest area was considered an optimal civic response tool. Large tanks and aircraft might have used the grounds or the Interstate to transport armed forces or emergency personnel. 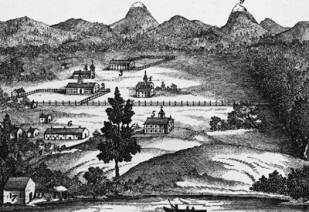 History of the surrounding region: Several historic communities surround French Prairie rest area, including Woodburn, Aurora, Gervais, Wilsonville, Champoeg, Saint Louis, and Saint Paul. French Prairie was originally the home of the Ahantchuyuk Kalapuyans, an aboriginal people whose numbers declined precipitously during 1830s and 1840s because of disease and Euro-American emigration. 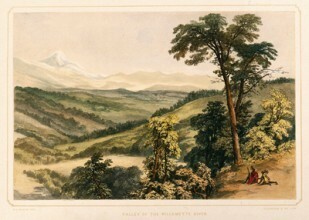 In 1814 near Newberg, the British established the pre-territorial Willamette Trading Post, a fur-trading operation. During the 1830s, the geographical area known as “French Prairie” extended to the Pudding River on the east, the Salem-Keizer metro area on the south, and the Willamette River to the north and west. French Prairie’s earliest settlers were former employees of the Hudson’s Bay Company and hailed from French Canadian-Metis communities. The Metis constructed log homes in the French style and established large wheat farms. Inter-marriage between settlers and the regional tribes created a multi-cultural agricultural heritage. By 1843, approximately 100 Canadian-Metis families lived on the prairie. Why the rest area formerly honored Sam Baldock: Robert H. “Sam” Baldock was an Oregon highway engineer who played an integral role in our state’s pre-WWII interstate development. According to the Oregon Department of Transportation’s (ODOT) history website, he was the “father of Oregon’s modern highway system.” Baldock was a major pioneer in using blacktop surfacing for roads, and pushed Oregon to adopt the material long before the rest of the US. Without Baldock, I-5 as we know it might not exist. Friends of French Prairie: Promotes sustainable agricultural production and certification of consumer products grown or produced by French Prairie farmers and ranchers. The organization also maintains area history through education and community involvement. Oregon Encyclopedia: An online resource for all things Oregon. The link provided here takes you to their article on the history of French Prairie. Oregon Department of Transportation: ODOT maintains a large directory of historical data about highway engineering and influential personnel. This link will take you to the history of Oregon’s highway systems and the contributions of Sam Baldock. Solar station: Portland General Electric and ODOT partnered to build the state’s largest solar station on land behind the French Prairie rest area. Motorists interested in learning more can access the station from French Prairie’s rear parking lot. PGE and ODOT have installed interpretive panels describing this sustainable energy project.